Setting a text to music may seem trivial but is really, or at least can be, quite a complicated process. The melody, the rhythm, the structure of the whole piece, even the harmony may be carefully picked or constructed to fit a narrative, lyrical metre or some other aspect or aspects of whatever text you are using. Thus, having to adapt music previously written for one particular text to another, however related they may be, can be a rather arduous task. This is something I’m currently doing, which is why I wanted to take a few minutes to write about it here. Last year, I composed a piece for mixed choir based on the poem “Romanska bågar” by Nobel Prize-winning Swedish poet Tomas Tranströmer. Earlier this year a music publisher told me they want to pick it up and also asked if I could make a version for the international market. 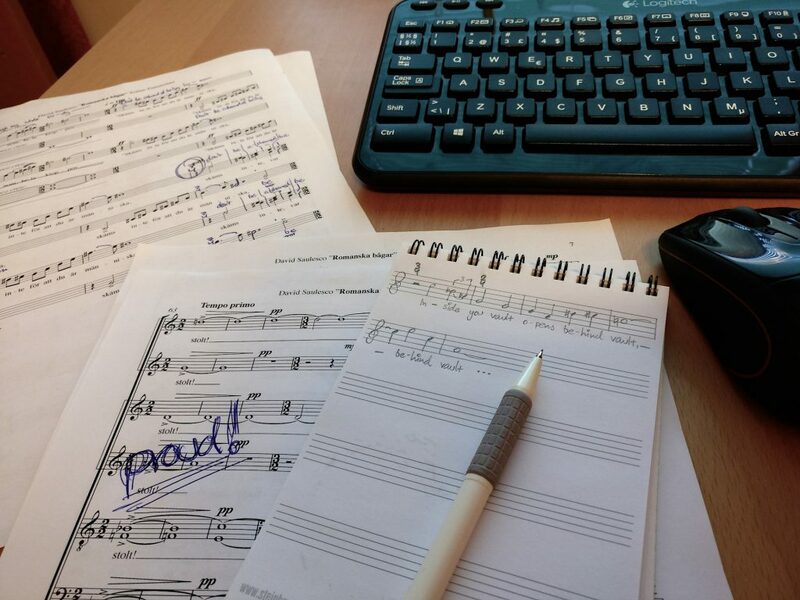 Excited, I agreed and am now doing precisely what I described above: adapting the music I originally wrote to fit the Swedish text, essentially retrofitting it to the English translation by Scottish poet and writer Robin Fulton Macpherson. However, there’s trouble on the horizon. Just a few bars later, in fact. There’s a small but oh so significant one-syllable difference between the Swedish original “skäms inte” and the English translation “don’t be ashamed”. However, “var stolt” and “be proud” are both two syllables. This means I need to adjust the music in a way that doesn’t affect it too much – both versions of the piece should feel effectively like the same piece so there shouldn’t be any big differences – but still makes the translated version sound every bit as natural as the original. Preferably, both versions should give the impression that they ‘came first’, so to speak. After a bit of trial and error, trying out different solutions and singing to myself as well as asking friends to sing for (and with) me, I found that the best solution in this case was to simply add another beat. It maintains the flow and the feel of the original and doesn’t stand out as odd or forced in the context of the music. There’s also a rallentando in that particular bar, which helps mask the difference. This was far from the most difficult issue I encountered, but it’s simple enough to make a good example and I hope you found it instructive and interesting! The choral piece, “Romanska bågar”/”Romanesque Arches”, will be published later this year by Gehrmans Musikförlag. I will write more about it here when it’s time and you will be able to purchase the score directly from them as well as from assorted sheet music stores.